Sandstone was a common building material during the early years of Washington, D.C., because it could be found locally in a government-owned quarry and was easy to cut to shape. Builders originally used sandstone for the exterior of the U.S. Capitol as well as for interior floors, walls and other elements. Because sandstone is a soft material, the exterior eventually wore down and most was either covered over or replaced with harder stone; the interior features remain visible. Sandstone is a sedimentary stone formed by the consolidation of individual grains of sand, which are usually comprised of quartz or feldspar. The most common method of consolidation is the saturation of a sand bed by other materials, such as clay or calcite, but sometimes it results from pressure that develops as newer geological layers are deposited on the top of the bed. Sandstone can be found in a variety of colors, which are determined by its mineral composition; the most common are tan, brown, yellow, red, gray, green and white. Sandstone has been used since prehistoric times to construct buildings ranging from homes to cathedrals. Its domestic and artistic uses include lamps, vessels, grindstones, statues and fountains. Different types vary in their hardness, but, in general, it is softer, and therefore much easier to quarry and shape, than many other stones. This characteristic also makes it vulnerable to erosion, and many sandstone formations around the world have been "sculpted" by wind and water into spectacular shapes. Unfortunately, the exterior surfaces of sandstone buildings and other objects are also soon affected by the same forces, and spalling (the breaking off of chips or slabs) is not uncommon. The U.S. Capitol's builders knew that sandstone was not an ideal building material, but when construction began few alternatives were available in the new federal city. Sandstone from a newly acquired quarry in Aquia Creek, Virginia, was used for floors, walls, columns, and the exterior cladding of the building. By the time that the Capitol's House and Senate extensions were constructed in the mid-18th century, marble took the place of sandstone. For the mid-20th-century extension of the east central front, the sandstone façade was replicated in marble. The old walls were left in place to become a part of the interior wall; the exterior columns were removed and now stand at the National Arboretum. During the 1980s, the U.S. Capitol's original sandstone west front was restored in a project that included replacing 40 percent of the sandstone with limestone. Today, the largest expanse of the building's original sandstone can be seen in the Rotunda walls, which support the cast-iron dome. 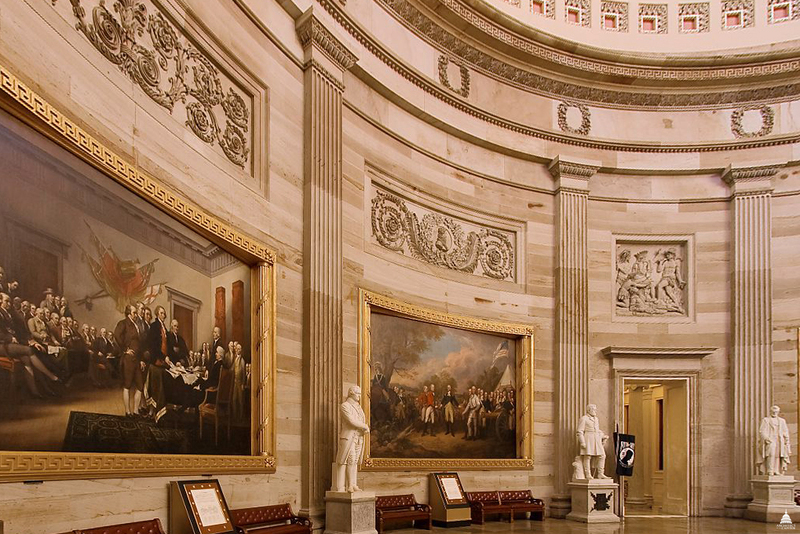 The U.S. Capitol Visitor Center built in the 2000s has walls and columns faced in sandstone chosen for its resemblance to the Rotunda walls.